(Bloomberg) -- Jeremy Corbyn being elected U.K. prime minister would be just as damaging to British banks’ profits as the country crashing out of the European Union without a withdrawal agreement, according to Citigroup Inc. 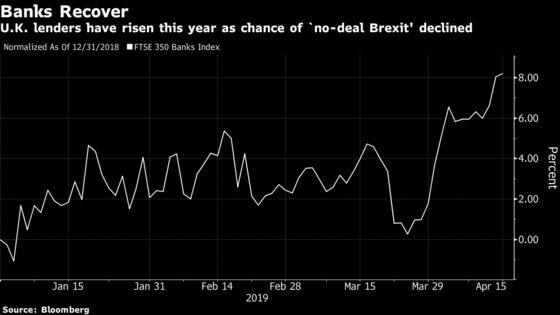 While London-listed bank stocks have recovered from last year’s lows as the risk of a “no-deal Brexit” gradually subsides, a snap election is becoming more likely as lawmakers in Westminster remain unable to agree on a future relationship with the EU. Citigroup’s review of Labour Party pledges doesn’t bode well for the financial sector. “The impact on U.K. domestic bank EPS could potentially be similar in magnitude to a no-deal Brexit outcome, mainly due to a fall in business investment, housing controls, less cost flexibility and higher taxes,” analysts including Andrew Coombs wrote in a note to clients. Domestic banks would initially move sharply lower with the pound if Labour came to power, due to the “business unfriendly” deficit-financed policies included in the party’s current manifesto that would likely lead to capital outflows from the U.K., Citigroup says. The more international banks would likely “hold firm,” however, given the boost from an expected decline in sterling. On Labour’s intention to nationalize and break-up The Royal Bank of Scotland Group Plc, Citigroup says it remains unclear how such a plan would be financed.